This topic turned out to be a difficult one for me because there are too many choices in Italy! Coffee? Espresso or cappuccino, caffè macchiato or latte macchiato. Wine? Red, white, or pink, house or vintage. Water? Mineral or tap, fizzy or still. My mind swirled with the possibilities. I needed to clear my head, so I went for a walk. The afternoon passeggiata is a time-honored tradition in Italy. People stroll down the avenues and window shop; they linger in piazzas and gossip; they admire babies in pushcarts; they greet friends and neighbors. And, if they don’t favor a gelato, they usually stop by a bar for an aperitivo before going home to dinner. At my neighborhood bar, family and friends cluster around tables for this ritual. Many Italians rarely drink alcohol, just a celebratory sip of wine at birthdays and Holy Communion. For these people, bitter (pronounced BEE tare) is the drink of choice. This herbal-based brew is a refreshing carbonated confection that comes in red or white, like wine. Oranges give the red its color and strengthen its flavor. Most bitter is bottled in 100 ml glass containers‒about three and a half ounces. Kept in the cooler, bitter is served with a slice of lemon or orange. These should not be confused with amaro (the Italian word for bitter) which is a digestivo and served after dinner. 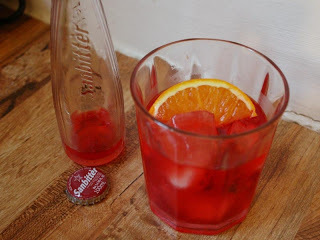 For the people who want a bit of kick with their aperitivo, Campari reigns as the drink of choice. Also based on various herbs, straight Campari has about 20 percent alcoholic content, but it usually comes as Campari Soda at 10 percent. Sometimes served over ice, Campari Soda is also accompanied by a slice of lemon or orange. Campari is the key ingredient in a variety of cocktails rarely, if ever, served in my neighborhood bar. 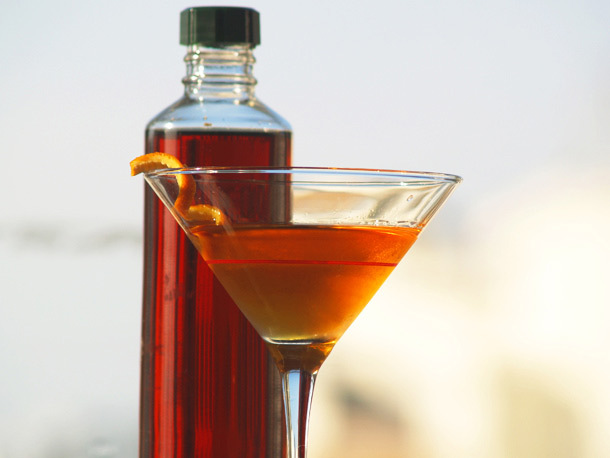 The best-known of these, Negroni, contains Campari, gin, and red vermouth. Vermouth steps up as the next favored aperitivo. The vermouth that stars in the standard martini just doesn’t do it, either. Italian vermouth comes in sweet and dry, red and white. The choices never end. Yet another herbal-based confection, Italian vermouth varies by brand, the most popular being Cinzano. But, even the lesser-known can satisfy. During aperitivo hour, children probably drink Cokes, and at least one person is sure to have a glass of mineral water. That’s a perfectly acceptable drink at the bar. When the drinks arrive, the staff also brings snacks. These can be as simple as a bowl of potato chips and a plate of olives. Other times, there are small sandwiches and tiny pizzas. 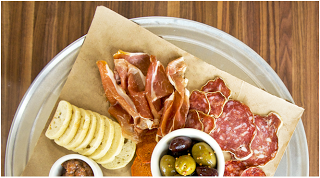 You might get fried potatoes or strips of prosciutto, rounds of salami or pieces of cheese. The same establishment may be generous with the snacks one day and stingy the next. After drinking and snacking, I’m not sure that I really need dinner.